Open studio THIRD THURSDAY of each month, 6-9PM at Ballardworks during the Ballard Artwalk. BA in Fine Art from University of Washington. Continuing studies in printmaking, painting, photography and textile arts. 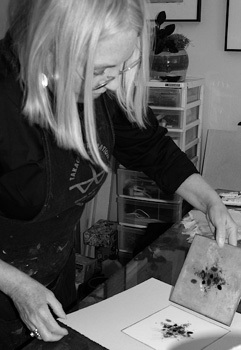 Currently maintains a painting and printmaking studio at Ballardworks, Seattle, Washington. Recently was on the teaching staff at Sev Shoon Arts Center as a monotype instructor for 12 years. Board member of Seattle Print Arts for 11 years.